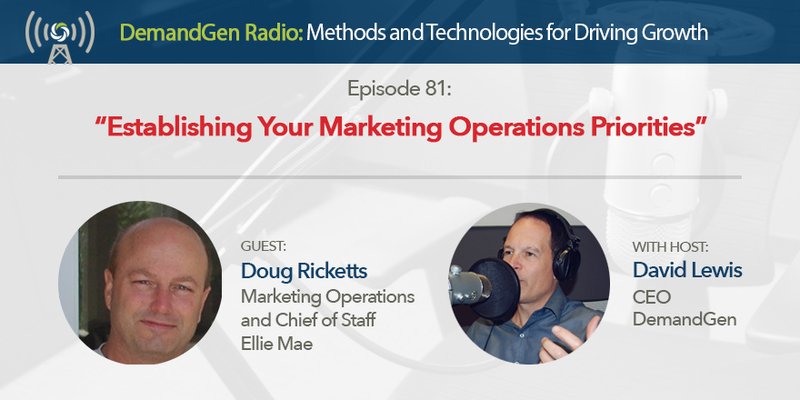 Doug Ricketts, Marketing Operations and Chief of Staff, joins the show to talk about some of the marketing operations initiatives he’s focusing on at Ellie Mae. Since leaving Ellie Mae in 2007, a lot has changed and I ask Doug to share how the company has transformed over the last eleven years into the marketing operations powerhouse that it is today. Tune into this episode as we also cover how to set goals and define success for lower-funnel initiatives and talk about how to promote greater product adoption and decrease attrition. Doug also goes into detail about his role and responsibilities, how the marketing team at Ellie Mae is structured, and his process for evaluating and implementing new marketing technologies.